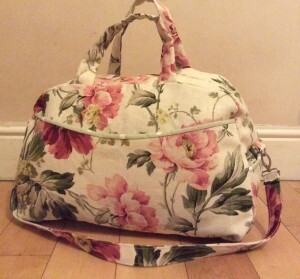 Come along and make one of these gorgeous, roomy travel holdalls, great for holidays and weekend breaks! The outer fabric is great made in a medium to heavy weight curtain fabric with a contrast/coordinating padded lining, you can of course add as many fabrics as you choose! Holdalls have side and front lined pockets, chunky metal zip, padded handles and a removable shoulder strap. Great as a gift or as a treat for yourself. Additional costs: You will need 1.25 metres of 54"/60" wide medium/heavy weight (curtain fabric is good) for the outer fabric, 1 metre of similar weight for the lining, a 55cm chunky metal zip and matching thread. Everything else is included in the price. Holdalls measure approx. W= 50cm D=30cm H=35cm. Suitable for: Someone who is confident using a sewing machine.